I’m trying to be a radical, i really am. I mean, i just read me some Chomsky (see “Radical Chic”, above) to fan the flames of my outrage, and i’m tracking with great interest the Occupy Wall Street protests and their national spinoffs. But it’s really hard to be a radical when i’m being outflanked by folks like Mitt Romney, who as recently as the 4th of October was calling the protests “dangerous…class warfare” but has now turned around to the point of offering lukewarm support. Last Wednesday i rode down to our Federal Reserve Bank to offer my lukewarm support for our OccupySF encampment, figuring i’d roll along with them for a few blocks of their planned march through the financial district. Of course i’ve got so senile that i neglected to take along the modest sign i’d printed. Sigh. And when i arrived and started talking with people, my impression was similar to that recorded by CW Nevius in his Chronicle column yesterday. 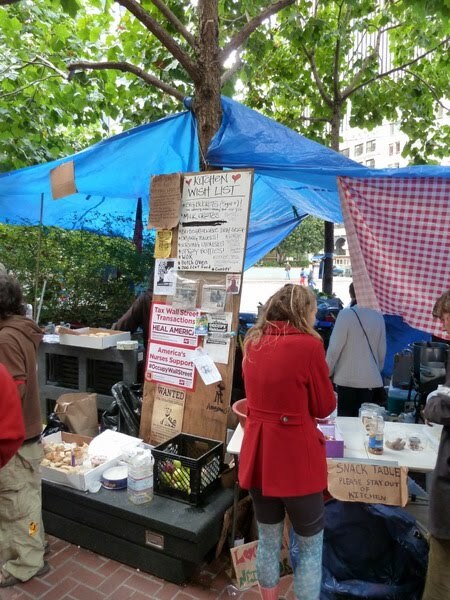 The Occupy folks in SF are hardly the radical fringe, with many of them seeming as middleclass as i am, with logistical support from local nurses and other groups. Dare i hope that what we are seeing here is leading to a turning point like that which happened in America a bit over forty years ago when suddenly the majority of the nation woke up one morning understanding that our leaders had deceived us and led us into a quagmire in Vietnam? Actually, it looks like we’ve already reached that point with regard to our wars in Aghanistan and Iraq. The next step is for the majority to understand that the whole purpose of the nation as it now exists is to enrich the 1% and that they now control all three branches of our government. This may be our last chance to tip the scale the other way. But i was tired and gave up waiting for the march to begin. Although i did go ahead and stop at Smitten on the way home for a couple of scoops of the Tcho chocolate. The rest of this story is that the march later that afternoon was a model of decorum on the part of both protesters and police, and that the encampment was broken up peacefully during the wee hours of the next morning but was rapidly reestablished. My friend Mark reports that there is now another encampment in front of the Federal office building at Seventh and Mission. On the afternoon of the 13th i rode down to the Fed Reserve building again to swell the crowd didn’t stay long because they were having an organizational meeting and i couldn’t hear much of what the speakers were saying. And besides, that evening i saw a poll that Fox had taken of its viewers, revealing that 70% of ’em agreed with the economic outlook of the Occupy movement.